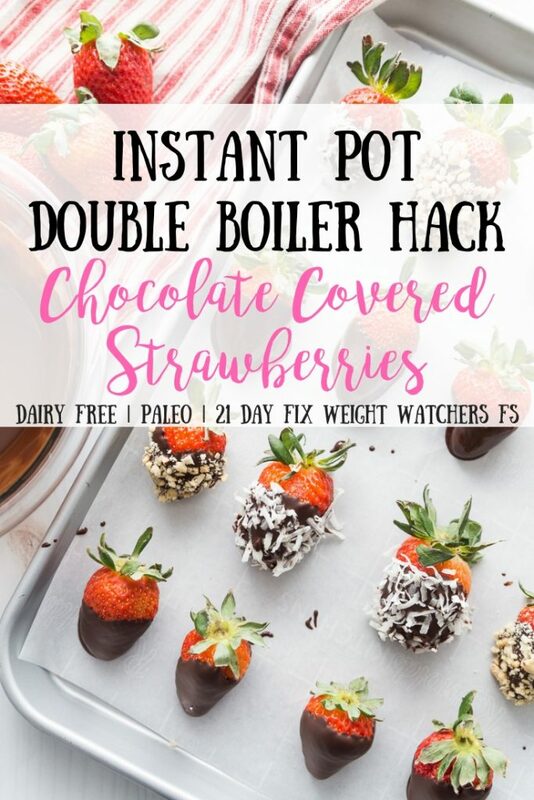 Did you know you can make Instant Pot Chocolate Covered Strawberries? 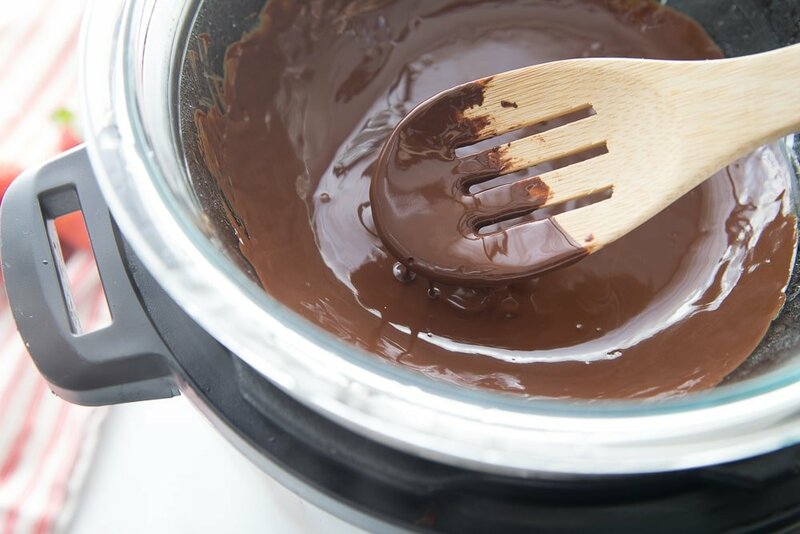 Yup, you can with this simple Instant Pot Double Boiler Hack! Another magical feature of the Instant Pot! This post contains affiliate links for products I’m obsessed with. 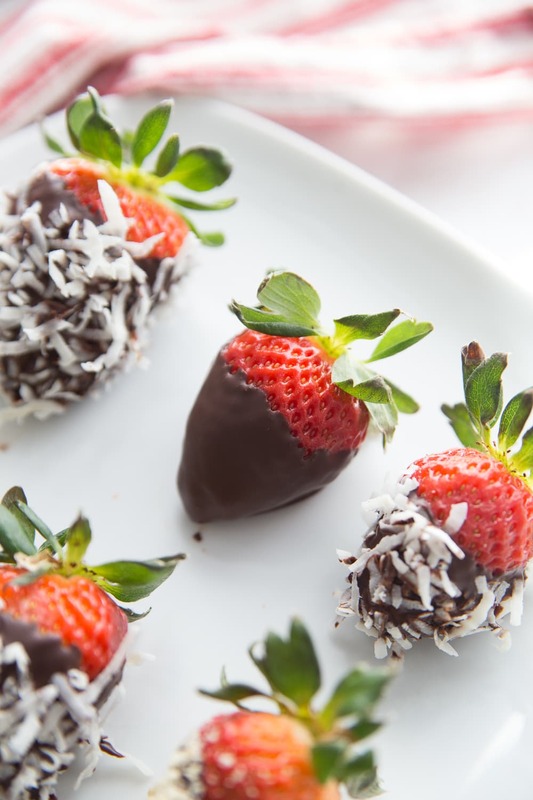 Don’t mind me…I’m just over here being all fancy with my Chocolate Covered Strawberries. I mean, aren’t they SO pretty? But guys…they are also SO freaking easy. And they are made even easier thanks to the Instant Pot Double Boiler Hack. I’ve dipped a LOT of things in chocolate over the years (I mean, haven’t we all? ), but I’ve never actually owned a double boiler. I’ve always use a pot or even the microwave which are fine, but girlfriend – have you ever burned chocolate? Omg. If you have, you know. It all happens so fast. In the flash of a second, all your chocolate dreams are crushed and you are left with a lumpy, sad, and smelly mess. And a preschooler in tears because he takes his chocolate just as seriously as his momma. ? 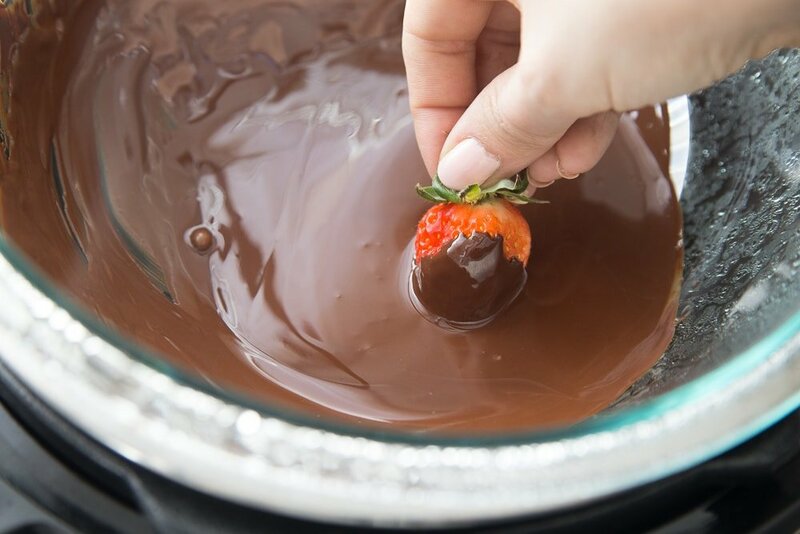 But using the Instant Pot as a double boiler is a genius way to make sure your chocolate does NOT burn…it will stay nice and warm and perfectly melted so you can dip away to your hearts content. 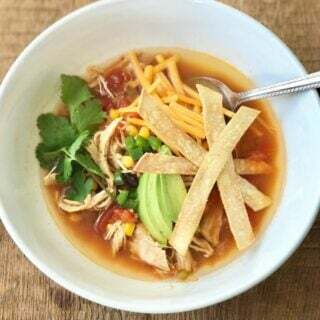 All you need is your Instant Pot, 1-2 cups of water, and a glass mixing bowl that is slightly larger than your Instant Pot. The bottom of the bowl should fit inside of the Instant Pot and the top should stick out like in the photo above. Then you just use your saute setting to heat the water underneath and melt your chocolate. Once your chocolate is nearly smooth, just switch it to keep warm! What is the best kind of chocolate to use for healthier chocolate covered strawberries? 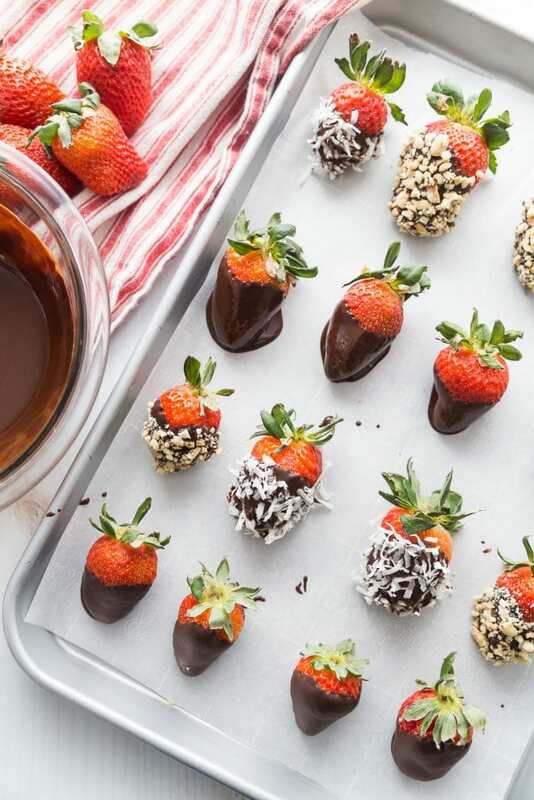 For all my FIXers, you have two options to make these Chocolate Covered Strawberries. First, you can make a pantry chocolate sauce like we do for my Banana Ice Cream Bon Bons. It’s simple – you just mix coconut oil, cocoa powder, maple syrup or honey, and vanilla extract together and voila! I love this option because 1. It’s not a treat swap if you have just a few and 2. I always have these ingredients on hand, and chocolate chips don’t seem to last in my house (guilty!). But you can also use dark chocolate chips and stay on plan! You just want to save yourself a treat swap and watch your portion size! We love Enjoy Life brand dark chocolate chips because they are free of all major allergens including dairy and gluten, and paleo, too – no yucky artificial ingredients. And my trick to making chocolate nice and shiny and smooth is to use a little coconut oil in the melting process. I used to use shortening back in the day, but coconut oil works even better! You can also use a high quality dark chocolate bar broken into pieces. Just be sure to look at the ingredients and sugar content when making your choice! In addition to strawberries, we love to dip bananas, cherries, even clementines into melted chocolate. We also throw the occasional marshmallow in, too, because YUM. 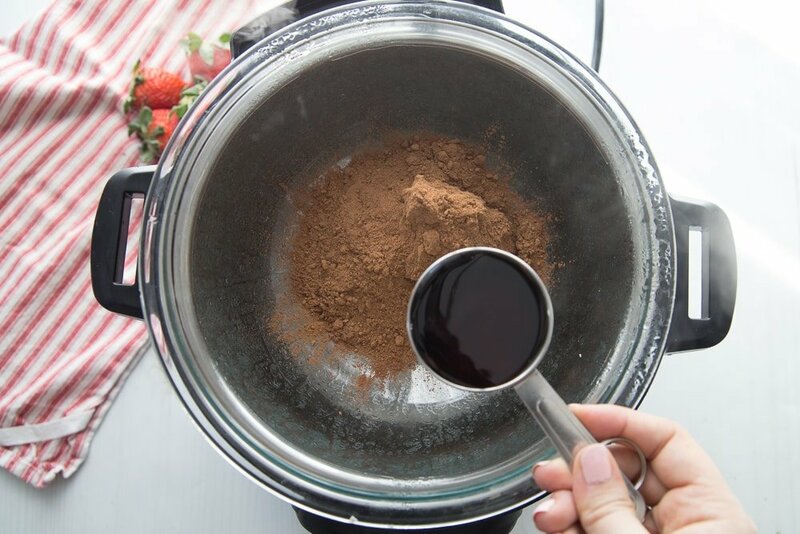 You can also use your Instant Pot as a double boiler for my 21 Day Fix Dairy Free Chocolate Fondue – another fun, kid friendly treat! And if you have an orange container around for the FIX, you can add some toppings! I always struggle to get my orange container in, so dipping in crushed peanuts and unsweetened shredded coconut is a yummy way to get that orange in! I mean, look! 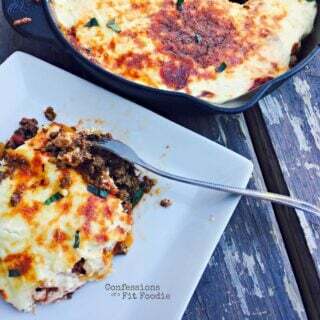 So, so pretty and not a lot of effort at all! I often make these for dinner parties and dessert and they are always a HUGE hit. I love that I can focus more attention on the meal because dessert is so easy. Take a look at this handy video to see how easy it really is! You will want to keep your berries in your fridge and eat them within 1-2 days or they will start to get a little juicy and ruin the chocolate. You can always freeze these for 1-2 months if you want to make a bunch and not have to share :). 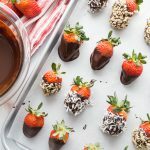 Did you know you can make Instant Pot Chocolate Covered Strawberries? 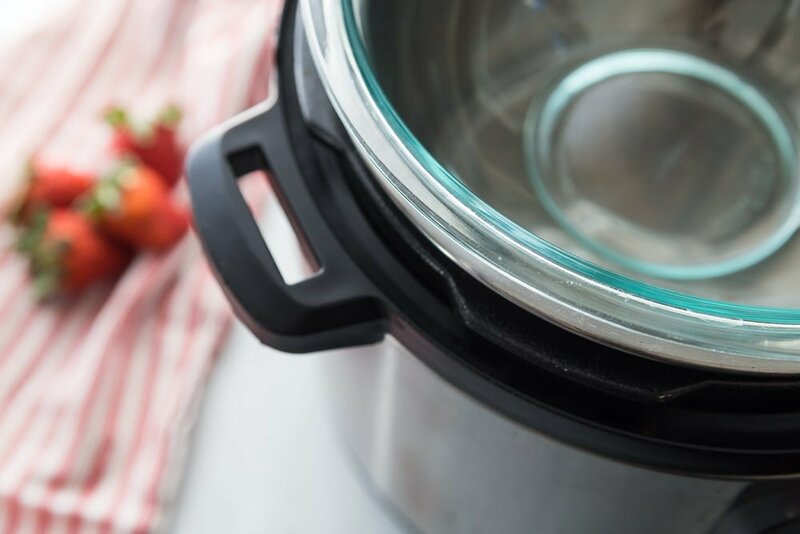 Yup, you can with this simple Instant Pot Double Boiler Hack! Another magical feature of the Instant Pot! Pour 1-2 cups of water into the bottom of the Instant Pot liner. 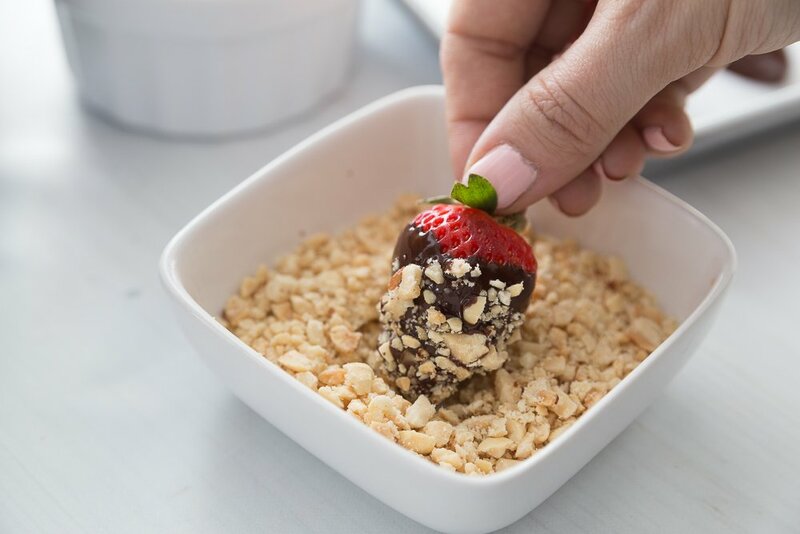 Place a glass bowl on top of the liner – make sure the glass bowl fits inside the pot with the top of the bowl above the liner like a traditional double boiler. Set Instant Pot to Saute – be sure it’s on low or normal and not high. Place coconut oil and chocolate chips in the glass bowl. Stir chocolate mixture until smooth. After the chocolate is smooth, press cancel and then hit the keep warm button. Dip strawberries in chocolate, covering almost to the stem. 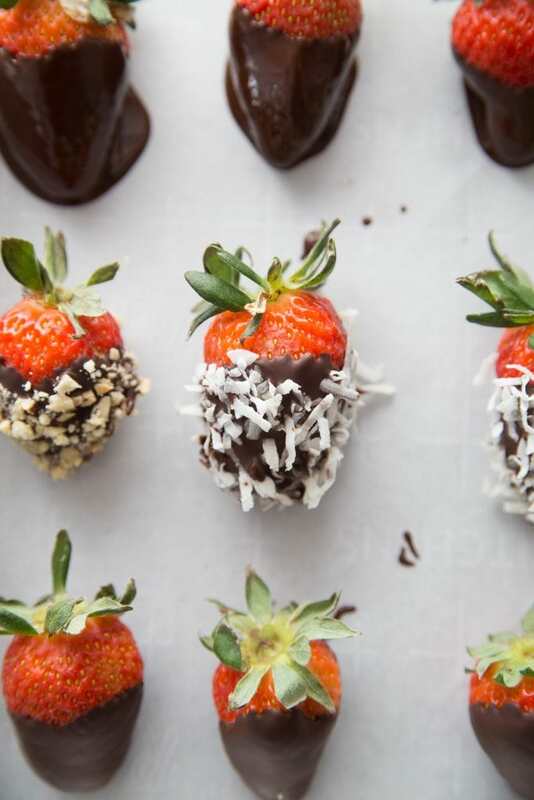 Place covered strawberries on a parchment paper lined baking sheet. If you want, add some crushed peanuts or shredded coconut to some of the strawberries. Place berries in the fridge for 15 minutes to allow chocolate to harden before serving. These will keep in the refrigerator for 1-2 days or the freezer for 2 months. Place coconut oil in the glass bowl and melt. Add the remaining ingredients and stir chocolate mixture until smooth. **If you have smaller strawberries or if you dip lower, you can make and have MORE…so if you make 30 strawberries, you can have 3 for the same counts. If you make 38 strawberries, you can have 4 for the same counts except 1/3 purple. If you add peanuts or coconut to your strawberries, be sure to count your orange. I measured 1/2 orange for each strawberry. Stovetop option: In a small saucepan, heat coconut oil over medium low heat, then whisk in cocoa powder, maple syrup, salt, and vanilla extract or chocolate chips. Remove from heat and continue to whisk until smooth. 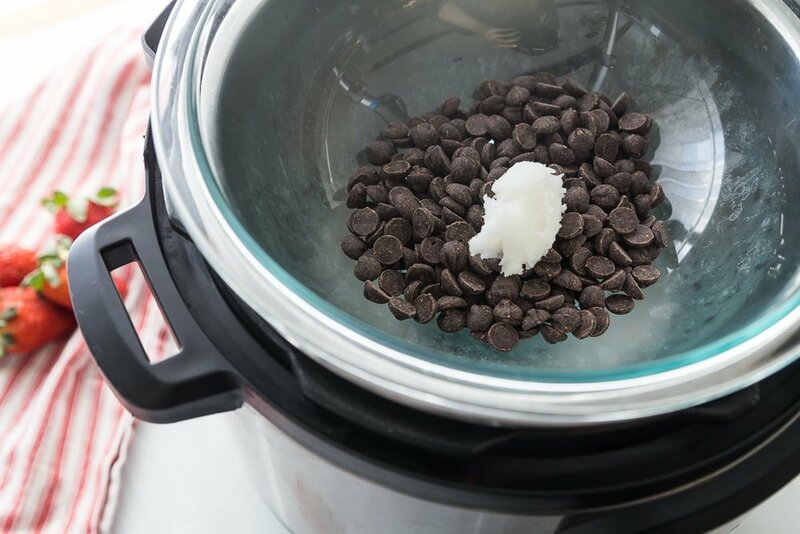 Microwave option: In a microwave save bowl, melt coconut oil, then whisk in cocoa powder, maple syrup, salt, and vanilla extract or chocolate chips and stir until smooth. The chocolate chips will require extra heating – place in the microwave for ten seconds at a time, stirring in between until smooth. What size IP are you using. Also, what size pyrex bowl are you using? The sizes I saw on amazon don’t seem to fit. I measured my IP: 3qt, 6qt and 8qt. I plan to make some of the strawberries for my mom in the assisted living home for valentine’s day. I think the double boiler idea is so excellent. I am going to use it for some other things too. thanks for the post. Hi! I am SO sorry that I didn’t see this in time – it’s been a busy week here! I used my 6 quart IP and my bowl was a 4 quart pyrex that was about 10 inches in diameter!